Located in the heart of central Asia, Mongolia is truly one of the world's great adventure travel destinations. From its incredibly diverse and sweeping landscapes, to its amazingly friendly and accommodating people, this is a country that will never cease to surprise and delight you. It is a place where the culture and history date back thousands of years, and yet its past is still revered and celebrated even in the 21st century. From it's thoroughly modern capital city of Ulaanbaatar to the wide-open and dramatic steppe, Mongolia will find ways to take your breath away. And when you're ready to go to extremes, the Altai Mountains and Gobi Desert beckon like a siren song that any adventurer will find hard to resist. With a population of more than 1.5 million, nearly half the entire population of Mongolia calls Ulaanbaatar home. The city serves as an excellent base camp for visiting travelers, offering plenty of modern and comfortable hotels to stay in — not to mention good restaurants and clubs to visit — while there. The vast majority of visitors to Mongolia arrive via plane or train in "UB" as it is colloquially known, giving them the perfect opportunity to rest for a few days before venturing out. Some of the highlights include visiting the National History Museum, strolling through the Genghis Khan Statue Complex, and dropping by the famous Gandantegchinlen Monastery, which is home to more than 150 Buddhist monks. You'll also find a number of day tours and guides that operate out of Ulaanbaatar, allowing visitors to venture out to nearby villages, parks, and other points of interest located in the area. A ger or yurt is a traditional Mongolian dwelling that has been used on the Central Asian steppe for thousands of years. Larger, more durable, and sturdier than a tent, a ger is nevertheless still portable and relatively easy to set up. Nomads have used yurts as shelters for generations, keeping them well protected from the wind, rain, snow, and cold. Naturally, they make for a great place for visitors to spend the night too, creating a unique camping experience unlike any other. There are dozens of ger camps found throughout Mongolia, offering everything from a basic place to spend the night to luxury upscale experience. Some are located in or near urban locations, while others can be found in remote, wilderness environments. Either way, travelers get a sense of what it is like to stay in one of these unique and enchanting places. If you're looking for something close to Ulaanbaatar, then give the Secret History Ger Camp a go. It has more than 45 yurts to choose from, with a wide range of options. If you're wandering further afield, then the Ursa Major Ger Camp is a must-do, and if you're going to the Gobi Desert, add the Three Camel Lodge to your itinerary. Mongolia is home to arguably the greatest horsemen that have ever lived, which is why Genghis Kahn was able to build and maintain such a massive empire. 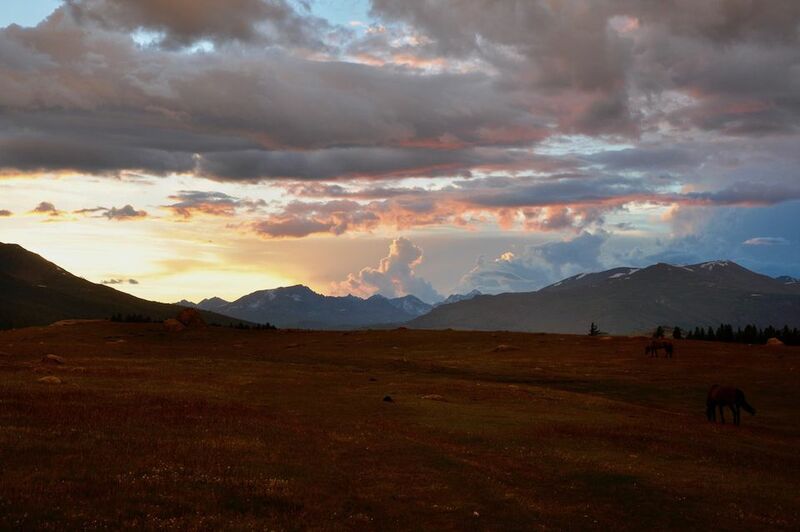 So what better way to explore this spectacular country than by horseback? Adventure travel company Tusker Trail offers a fantastic itinerary that takes visitors deep into the Altai Mountains along Mongolia's western border with China. This vast, and beautiful frontier is largely uninhabited, with just a few nomadic families that maintain a way of life that is very similar to how their ancestors lived hundreds of years ago. The snow capped mountains of the Altai make for a dramatic backdrop for day-long horse rides, although if you'd prefer to hike that option is available too. Simply put, there is no better way to see this amazing country. Fatbikes have been a real game-changer for adventure travel, allowing cyclists to explore off-the-beaten-path destinations that would normally not be rideable at all. With their oversized tires and rugged frames, fatbikes are built to take on rugged terrain and offer a comfortable ride in the process. That makes them a great option for exploring Mongolia's Tavan Bogd National Park in the far western region of the country. The park is hundreds of square miles of unspoiled wilderness that is seldom visited by outsiders. In fact, chances are the only people you'll see there are the nomads who still call this place home. There aren't a lot of travel companies that operate in the area, but Round Square Adventures offers several departures each year, including one option that runs in conjunction with the famous Mongolian Eagle Festival. If horses aren't your thing, and you still want to experience the Altai Mountains, this is a fantastic alternative for doing just that. The Altai Mountains are beautiful and remote, but that isn't the only wilderness landscape that is worth visiting in Mongolia. The Gobi Desert stretches across more than 500,000 square miles, creating one of the most dramatic environments on the planet. Visitors are often captivated by the rolling sand dunes, rocky outcroppings, and arid plateaus. Despite that however, the Gobi is place that is filled with life, making it a must-see destination for any adventurous traveler. There are a number of ways to explore the Gobi, with options for half-day tours or longer excursions for those who have the inclination. But Nomadic Journeys' Camel Trek is a five day odyssey that through the Ikh Nart nature reserve that introduces visitors to some of the unique wildlife that inhabits that beautiful corner of the world. Anglers looking for an amazing challenge will want to put Mongolia on their list of places to visit as well. The country is home to the taxmen, which is the largest species of trout in the world. Some of these fish grow to more than 45 inches in length and weigh in excess of 60 pounds, making them quite a catch to reel in. All taimen fishing is of the catch-and-release variety of course, and there are numerous places where fishermen and women can try to land one of these monsters. Fish Mongolia offers some of the best opportunities to land these mega-trout, creating an experience that you won't soon forget. Mongolia's Naadam Festival is a traditional event that takes place in early- to mid-July each year. As with all things Mongolian, the origins of the festival date back hundreds of years, with connections to — you guessed it — Genghis Khan himself. As the story goes, the men from the Great Khan's army would challenge each other in three different events — archery, wrestling, and horse racing. Today, those three activities are still sit at the heart of the Naadam Festival, which draw hundreds of thousands of spectators each year. The Naadam is so ingrained in Mongolian culture that there isn't a single festival. Instead, you'll find them all across the country, ranging in size from small to incredibly large. If you're visiting in July, chances are there will be a Naadam taking place somewhere close to where you are staying and you should most definitely take the opportunity to attend. One of Mongolia's more revered traditions is hunting with eagles a practice that stretches back more than 6000 years. The nomads of the steppe domesticated birds of prey to assist them in fox hunting as a way to protect their herds. In remote regions of the country, eagles and falcons are still used in this way, making it a mesmerizing experience for visitors. The eagle hunter typically only ply their trade in the winter, although they are often willing to introduce travelers to their birds anytime of the year. Tour operators and guides can generally help connect you with a local hunter, proving the ability to see a magnificent golden eagle up close and personal. The winters in Mongolia are legendary for their length and severity. In fact, Ulaanbaatar holds the distinction of being the coldest capital city in the world, with temperatures routinely dropping to -40 degrees F in January. Those who don't mind braving the cold will find amazing opportunities for winter adventure here, including one of the most unique travel experiences imaginable. In addition to offering a summer journey on horseback to the Altai, Tusker Trail has a winter itinerary that is unlike any other too. Visitors will actually travel with the nomadic herders as they move from their autumn camp to the more permanent shelter of their winter home, getting a chance to explore the mountain landscape that few outsiders ever get to see. This adventure takes places in February each year, when the days are short and the light is dramatic. This creates an atmosphere that will appeal to photographers who are looking to capture stunning images unlike anything they've seen before.